You will love being at the pool while wearing this stylish Adidas Mens Solid Aquashort - Shock Blue! 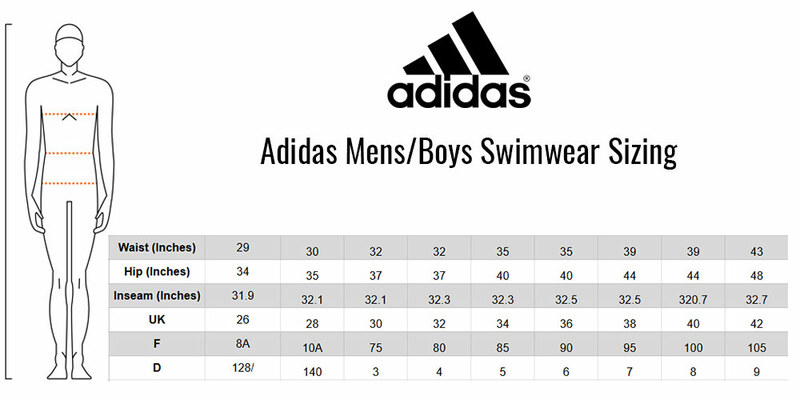 The Adidas Solid Aquashort has the iconic 'adidas' name and 3 stripe logo which will make him the center of attention during your swimming sessions! This Adidas swimshort offers the perfect blend of comfort and durability making it the perfect men's swimsuit for your training, fitness and leisure swimming sessions. The Adidas Mens Solid Aquashort comes in a stylish shock blue design and features the famous 'adidas' logo and 3 stripe print. These Swimming shorts are made from a chlorine resistance 'INFINITEX®+' fabric which offers excellent protection from UV rays & fading alongside excellent shape retention making this Adidas swimshort ideal for your training, fitness and leisure swim sessions! Long Lasting Adidas INFINITEX®+ Fabric allows this swimshort to last for 100s of hours making it perfect for regular swim training.